Sometimes I think that plants are simply a justification for having some really cool plant containers. 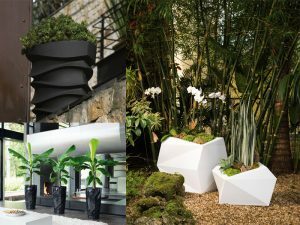 In many ways, the plant containers you choose have a greater impact on your overall design than the plants themselves, whether your project is an interiorscape, patioscape or other form of urban horticulture. 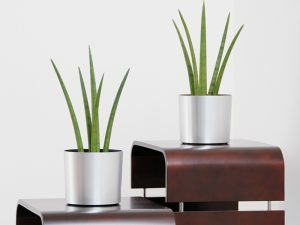 Choosing the planter that will pull your design together and appeal to your client can be tricky. Your client probably doesn’t know exactly what they want—they are looking to you to be the expert and choose for them. Budget is usually a factor, to a degree. If the client doesn’t want to divulge their budget, their other furnishings will usually give you a clue. You should always offer two choices, one of which is an upgrade to a higher-end container line. People will justify the cost and find a place in the budget for something they really, really want. 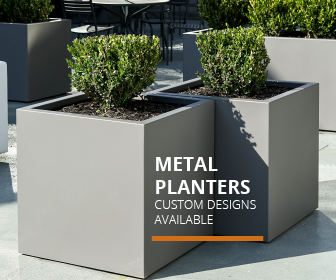 Perhaps the biggest factor is choosing plant containers that will complement and enhance your clients’ message or brand. In other words, how do your clients want their employees and guests to feel when they enter the space? What is the message they want to send to their visitors, employees and guests? If it’s a financial firm or a major corporation, they probably want people to feel that they are trustworthy and conservative in their investments and activities. This is also true of many types of businesses found in the Northeast and Midwest areas. For example, I went to Boston recently, wearing my usual boho-chic Texas clothes. I soon discovered that no one—NO ONE—was dressed like me! Everyone was wearing black and white. And yes, the businesses I visited all had conservative interior designs, with the exception of the trendier areas. 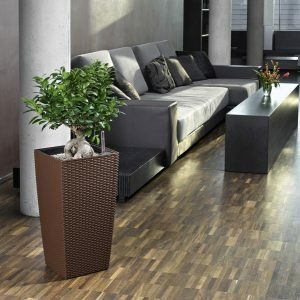 Recommended plant containers: Cylinder or fishbowl shapes in conservative, neutral colors that complement the décor. Green walls that include a conservative design or the company’s logo will also work. Many technology-based companies are in a frenzied competition to hire the best, young tech-savvy employees they can possibly find. To attract this type of employee, they want their interior space to feel hip and cool, a place where you’ll have fun at work. Trendy restaurants, hotels and shopping spots may also want to convey this message. Many businesses in California, tourist destinations and art-centered communities also want to appeal to the hip crowd. Recommended containers: This is when you can go wild and have some fun! Vertical containers, organic and unusual shapes, and white or very bright colors are the go-to for this type of client. And feel to include accessories, like sculptures, art glass, and matching or coordinating globes and cubes in fun fiberglass shapes. Don’t forget green walls with colorful designs! Many businesses today want to convey that they are earth-friendly to the eco-conscious consumer. This appeal is particularly important to those customers in their 20’s and 30’s. This is a no-brainer for businesses selling eco-friendly products such as organic cotton clothing, or spas and eco-tourist spots. This client is very similar to the hip and trendy customer, but with a mother-earth, tree-hugger twist. 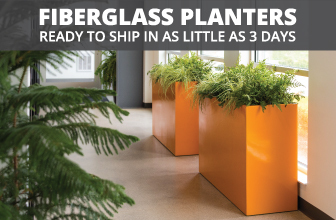 Recommend containers: This client will be more open to lots of smaller plants. Organic shapes in natural materials, wood finishes or matte white will fit the bill. Terracotta and wicker can be used outdoors. Containers don’t necessarily need to match as long as they look coordinated. Green walls with curving shapes within the design are also good choices. This particular niche may want to convey different messages, depending on the owners. Some want to parade their wealth and good taste, particularly if they frequently host important business contacts or high-end charity events. Others may want to create a place for their children to play and feel safe and secure. Others want a quiet, perhaps luxurious refuge from the busy-ness of their work world. Recommended containers: Choices may range from very high-end or custom-made containers to soft, organic shapes. You will most likely be working with the interior designer and home owner, who will have definite ideas on what they want. Be sure to offer something out of the ordinary if you think it will work well for their décor. Kathy is a LEED AP with specialty and has developed a comprehensive green certification program for landscape and interiorscape businesses, projects and approved products. She has over 30 years experience working in the horticulture industry in sales, marketing and management. She is the publisher of the online magazine, I-Plants Magazine.